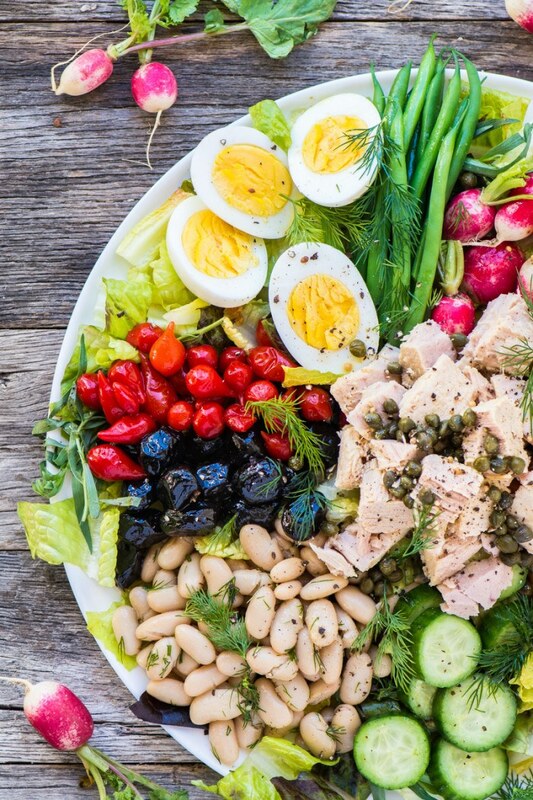 How to Make the Perfect Salad Niçoise ~ a Nicoise salad is a healthy, colorful and protein packed main course tuna salad that can be made all year long. Whisk together the dressing ingredients and season with salt and pepper to taste. Add more lemon juice if you like. Put the lettuce in a wide shallow salad bowl or platter and arrange the tarragon leaves over the lettuce. Toss the beans with a little of the dressing, and some of the fresh dill. Pile the beans into a heap on the edge of the salad, leaving the center free for the tuna. Arrange the cucumber slices and carrots in little piles next to the beans. Toss the potatoes with a little of the dressing and dill, and add them to the salad. Arrange the tomatoes, radishes, green beans, eggs, peppers, and olives in a similar manner all around the edge of the platter. Put the tuna in the center of the salad and top with the capers. Scatter the fresh dill over all. Drizzle with the dressing just before serving. Add salt and pepper to taste.